Shankar Mahadevan was born in Chembur, Mumbai into a Tamil family from Palakkad, Kerala.He learned Hindustani classical and Carnatic music as a child, and began playing the veena at the age of five. Mahadevan studied music under Pandit Shrinivas Khale. He is an alumni of the school Swami Vivekananda High School and graduated in 1988 with a degree in Computer Science and Software Engineering from the Ramrao Adik Institute of Technology in Navi Mumbai, affiliated to Mumbai University, and was a software engineer for the company, Leading Edge. After working for Leading Edge Systems (now Trigyn Technologies Limited), Mahadevan ventured into music. 2019: Padma Shri Award for his contributions to Film Music under the category Arts. ^ Puri, Amit (21 October 2002). "Nerd who started at 5 and still not Breathless". Tribune India. Archived from the original on 10 March 2007. Retrieved 20 November 2009. ^ "Interesting facts about musical genius Shankar Mahadevan". India TV. Retrieved 4 March 2016. ^ @shankar_live (3 April 2011). "Went to my native place Palakkad.It is totally a different world there." (Tweet) – via Twitter. ^ "Khale a maestro till his last breath: Mahadevan". www.yahoo.com. ^ "Best Marathi songs by Shankar Mahadevan you would love to listen to". Times of India. 5 October 2018. ^ "Shankar Mahadevan Biography". Filmi Beat. Retrieved 18 February 2013. ^ Yasir, S.M. (6 November 2003). "Striking the right note... for his supper". The Hindu. Retrieved 20 November 2009. ^ "Folk music is above even classical music: Shankar Mahadevan". DNA India. 23 September 2018. ^ "Swaralaya Kairali Yesudas Award". Thiraseela.com. ^ Juhan Samuel. "Mohan Lal, Kaniha to get best actor, actress award!". Hindustan Times. Retrieved 30 October 2009. ^ "Critics award: Gaddama adjudged best film". The Indian Express. 26 February 2011. Retrieved 29 February 2012. ^ a b Array. "Lagna Pahave Karun - All Songs - Download or Listen Free - JioSaavn" – via www.jiosaavn.com. 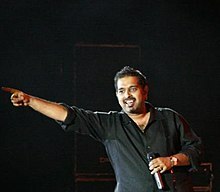 Wikimedia Commons has media related to Shankar Mahadevan.